[theSkinnery] for Rewind 70's Punk and Enchantment events! Comes in 5 skin tones, brown brow and no brow options and shape included in each pack. 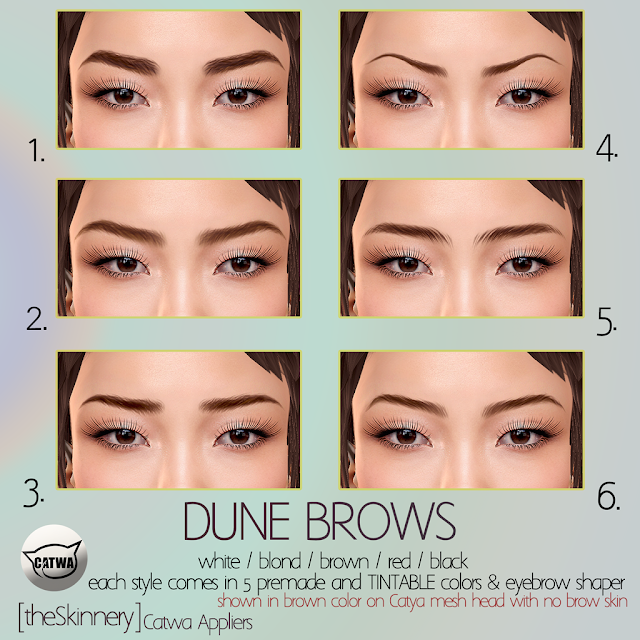 Dune Brows - eyebrow appliers for Catwa mesh heads in 6 styles. Each style is sold separate in 5 premade colors (white, blond, red, brown and black) and an eyebrow shaper to get the look showed in the ad. Can be easy tinted for a more personalized color using Catwa main hud. 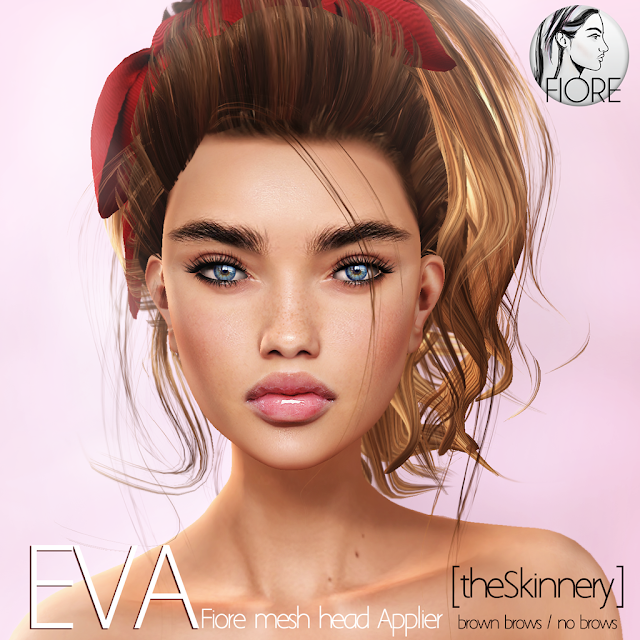 New skin applier for Fiore mesh heads - Eva @ Collabor 88 August round! Comes in 10 skin tones with brown brows and no brows options and works with bento and non bento mesh heads. 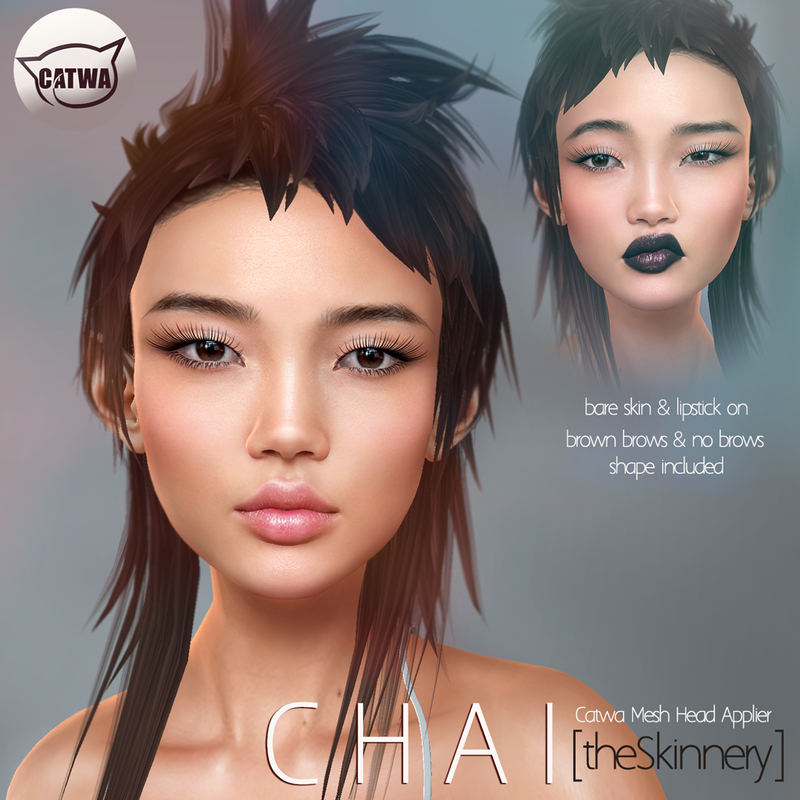 New Catwa mesh head applier - Chai @ Rewind 70's Punk! Comes in 5 skin tones, bare face and dark lipstick makeup, brown brows and no brows and shape included with every purchase. Comes in 5 skin tones with brown brow and no brow options. Two shapes (Catya and Tala heads) and eyebrow shaper included in every skin pack. New lipstick applier pack for LeLutka mesh heads, find the 15 summer colors in the Half Price room! Shown on Chloe head with Alix skin. [theSkinnery] for Shiny Shabby and New Group Gift! New LeLutka skin Alix at Shiny Shabby event and matching lipstick in mainstore as group gift! Comes in 8 skin tones with brown brow and no brow options. Shape and eyebrow shaper included in every pack.